Google Accelerated Mobile Pages (AMP) is the most important design and development change to hit webmasters in the last 5 to 10 years. If you’re publishing any kind of content on a mobile website, life just got complicated. To preface what the AMP project is, here’s some data: in 2011, a Kissmetrics study revealed 40% of users abandon a website after 3 seconds if it doesn’t load. One Piccadilly, two Piccadilly, three Piccadilly… goodbye. The same study reported 51% of mobile internet users having encountered a website that crashed, froze, or displayed errors. In the last 5 years site speed, user experience and search engine ranking weighed heavily on internet marketing agendas as millions of webmasters scrambled to lighten the load. Anyone who gives more than two hoots about Google as a mobile lead generator have dutifully played catch up to comply with the Mobilegeddon search algorithm, yet now the dangling carrot is AMP. Overall, it is claimed a site using AMP will load 4 times faster, rocketing a given webpage to the top of the world’s favourite search engine. The AMP project aims to improve mobile performance by displaying a significantly stripped down version of a mobile website as compared to the desktop version. With 10 times less data, much of the desktop functionality is completely gone on mobile, loading only text and images and iframes (video, audio). While you probably agree unnecessary website window dressing is useless, should you reduce your website to the bare minimum for the sake of search results? My answer: it really depends on your traffic strategy and conversion goals. The chatter from other marketers concerned with Accelerated Mobile Pages is that it might NOT be in YOUR best interest. Opinions are most definitely mixed. What AMP wants to do is change the way server requests are made and how they deliver web content. These are called “assets” which Google AMP versions of mobile sites will target and replace with Google assets. The Google content delivery network (CDN) will offer better distribution for your site. Bells, whistles and other unessential special features will be gone, not dissimilar to removing unneeded weight in a racing car to improve performance. AMP is a totally optional service for which a few media magnates and news corporations have already signed up to. So far, what appears to be a totally new algorithm is apparently yielding mobile search engine success. The BBC, Mashable and the Huffington Post are among those participating. WordPress, LinkedIn, Pinterest and Twitter also jumped on board. There’s a growing list of big publishers here. At the core of the big G’s efforts, is something called Zero Moment of Truth, born in 2011 and apparently the tech doctrine thought leadership guiding the corporation’s long term play. As a portal to content discovery, inclusion in the mobile SERPS is clearly important to the millions marketers already bending over backwards, however a study on The Drum found 75% of SEO specialists aren’t prepared for Google AMP. While the search giant does not own the internet, they are synonymous with it. It’s hard to ignore what they do and say. Here’s the question: should small business websites sign up for AMP when headers, sidebars and styles will be removed? If you don’t mind your mobile website being labotimized, go for it. I’m not sure I’m ready to sacrifice so much for Small Biz Geek, but I might test it on some local niche websites of mine. The primary navigation bar in AMP sites will disappear. It sounds problematic, but what will remain, however, is the footer. I’ve looked at some of the mobile sites using AMP and it’s possible to use basic text links in a three or four column footer at the bottom of the site as a navigation area.. It so happens that I already design mobile sites for clients this way. Once a mobile viewport is initiated, the navigation bar at the top of the website collapses into a hidden view which has to be tapped to be expanded. I’ve always maintained that it’s useful to have a “quick nav” in the footer so users don’t have to scroll all the way back up to the primary nav at the top of the site. A mobile site collapses into a single column in the smartphone viewport width, and if you add a basic text link footer navigation, you have compensated the lack of the primary navigation. Granted, the EU are holding an ePrivacy consultation in which the cookie notification disclosure could become a moot point, but still, it’s a dilemma because AMP is pulling us in a different direction. What about Google Adwords mobile click-throughs and conversions? I imagine mobile users clicking ads only to see a half baked plain white background webpage lacking opt in forms and other conversion conscious design. Good news on that front… kind of. Apparently, you do not need to have every page of your site as an AMP. You can still set up certain mobile pages as fully functional conversion funnels with all of the assets and sidebars intact. There’s also an AMP WordPress plugin by Automattic, the makers of WordPress. There’s no user interface for that plugin so you might want to study the official Google AMP documentation. 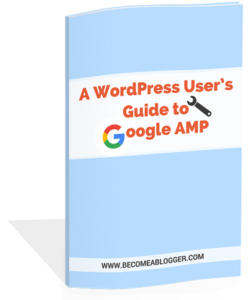 A PDF guide to implementing AMP is available here which was mentioned in an episode of the Social Media Examiner podcast all about Google AMP. The guide demos how to set up a couple of plugins including the plugin I just mentioned. You can test on a localhost such as WAMP, at least to preview what your posts/pages will look like. The screen show below is what my site would look like with everything but the content area gone. It hasn’t been tweaked much in the preview settings. The option to add a small PNG logo is available (what, no SVG?) but if you leave this blank the WordPress logo occupies that area. I use the Genesis Framework for WordPress development, so I tweeted StudioPress to ask their position on AMP. To what extent you get with the program is up to you, but before you make any decisions it’s worth thinking carefully about where you stand. My recommendation is that you begin improving general website performance on all devices without using Google AMP. Assuming you’re on WordPress, look at tools such as WP Optimize, WP Lazy Load Images, and possibly some CDN or caching plugins such as WP Super Cache. There’s an excellent free CDN caching service operating at the server level called CloudFlare which I’ve used it on every site of mine. While this is no match for Google’s CDN it is better than nothing if you decide not to convert your website. To increase load speed of mobile graphics such as header logos and sidebar images (also lowering file size), look into SVG design using software such as Adobe Illustrator. I’ve decided not to take up Google’s offer of an amazingly fast albeit “vanilla” website. The last time there was a supposed Google goldrush, it was the since defunct Google Authorship, which I observed from the sidelines while everyone else went cuckoo. Admittedly, this conundrum is about as straightforward as to whether Britain should remain in the European Union. The advantages and disadvantages are almost philosophical, meaning it’s never as easy as making a decision, ticking the box and moving on. For some businesses, the prospect of yet another Google SEO scoreboard is not worth the compromises, but I’m sure it will become an ultimatum one day, therefore you might want to experiment. Where is the (Google) Mobile Web Going? 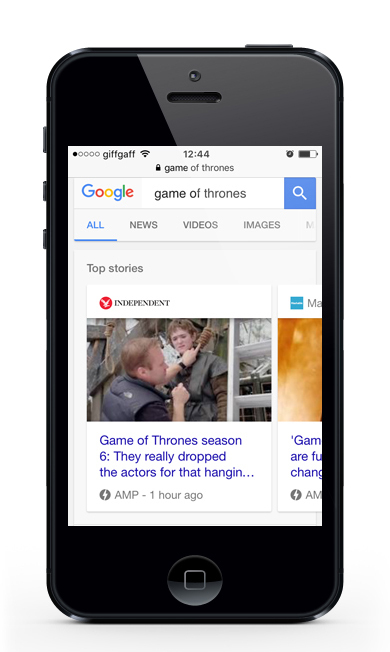 Accelerated Mobile Pages is Google’s attempt to win the news consumption war. By persuading webmasters to redevelop their websites on their end, Google aim to trump Apple News and Facebook Instant Articles which take content and rerender it themselves. While this is HUGE change, rolled out on the coattails of user’s expectations (according to Google’s worldview), it’s yet another indication that the search engine gravy train has stipulations if you want the rewards. Some webmasters are saying the open web has become closed. Hopefully, I’ll get to a local meetup this year and have some conversations about it. @SmallBizGeekUK possibly, it’s getting more of an ongoing concern. The issue I take is that Google’s so-called Zero Moment of Truth seems to imply websites should have ZERO character and no personality. That’s already the truth for many of the Plain Jane sites in vogue. Granted, a site mustn’t resemble an over decorated Christmas tree, but this is going too far. Why not round up all web designers, ship them to boot camp, shave their heads and have ’em lined up in their underwear awaiting orders? Here’s a video in which a group of sensible people have a balanced conversation about this pressing subject. It’s well worth watching. I’m a little tired of being expected to take Google’s medicine on blind faith. Open wide, here comes the choo choo train! 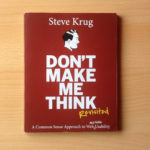 Your site will do well if you comply! If anything is wide open it should be our eyes. Surely, we can see the real benefits accrue to Google News and we’re a means to an end. Their attempt to beat Facebook Instant Articles is closing their version of the mobile web into a walled garden of limited HTML vocabulary. Obviously, I’m an AMP sceptic but that’s because I’m a general Google sceptic. Ever since their ridiculous “Don’t Be Evil” motto way back when, they immediately came off as disingenuous capitalists trying to bring back hippy power. There’s a book called The Google Story covering their culture, innovations and business deals up to and included 2008, but oh, how I’d like to read a book documenting the last few years. The controversy and incompetence of some of their doings is not widely known. Back to Accelerated Mobile Pages. Granted, it brings the focus onto the content, which is never a bad thing BUT will this benefit you or will this just help you-know-who lay the smack down its competitors? It should be a wake up call to the very real issue that too many sites are not fast, especially for those with slow internet. Bottom line: when the hierarchy of needs is not served, website visitors bounce. Thoughts?